Just a brief note about the group of four foster girls who passed through our hands so quickly we never got to blog them! The Soda Pop Girls were after the Mystery Girls, and before the Noisy Girls. The fourth one is climbing over the top of the others, under the blanket! This was another lively bunch, hard to get a group picture of. As you can see, they had quite distinct and unusual markings. I especially liked Shasta’s question mark! The names came about because, well – rat girls are fizzy. I’ve been wanting to use soda pop names for a while, but could never come up with the right number of rats to name. Then we got handed these four fizzy girls, and voila! The Soda Pop girls were very lucky to find a single home that wanted all four of them! They now have beautiful, four-syllable Japanese names that start with K, including Kimono and Katana. I’d have to dig a bit to find the others! Reports from their new mom is that they’re a joy to play with, and very friendly! Marbles, Bailey, and Mia…wait, Mia? Who’s she? As much as I want to keep updating you on foster ratties that have been and gone, I need to keep up with current rattie reality! Pitter Patter’s Noises are the four little foster girls we have in the house right now, and they are darling! Meet Boink, Eek, Chatter, and Flutter! They’re about seven and a half weeks old, and available now to adopt through Mainely Rat Rescue. I wish I could tell you who’s who in this photo, but they all look alike! All four girls are Black Berkshires, and except for their white bellies, they look almost identical. In personality, they’re very similar, too – all friendly, lively, and bouncy! Although they’re only 7 1/2 weeks, already they’re so used to people that they’re excited to play with and be handled; they take treats from the hand with no hesitation; and though highly energetic and squirmy, they are easy to pick up and hold. This is a lively bunch. I have never seen such a group of babies for popcorning, running, wrestling, and chasing each other around! It made it hard to get photos of the group, because they’re hardly still for a moment. I only managed the hammock shot above because they had just woken up when I opened the cage door. The idea was that I’d either be able to corral them in my arms, or they’d settle together on my shoulder. Then Gryphon could get a group photo, all of them together. Apparently, half of them liked the arms, and half the shoulder. As you can see, the general trend was in the direction of the door, and spaces beyond! These girls are all about exploring! Boink is actually a varieberk, not just a Berkshire. That means that her white markings come up her side. As you can see, she has two distinct white stripes on her left side. None of the other girls have such distinct side markings. If you look at Eek’s belly, you can see a place where the black on her sides narrows the white. In the photo above, the black peninsula on the left is rounded, and the one opposite it is pointed. All four girls have white tips to their tails as well, but Eek is the only one with just the smallest tip of the tail in white. All of the other three have at least a half-inch or so. “Flutter Funky-Belly,” that’s what we call this girl! Her white belly is the most irregularly shaped of the lot. The lower part looks a bit like Africa, with an extra stripe of land pointing off to the West. Chatter distinguishes herself by having the least irregular belly marking of the lot! I usually identify her by figuring out who the other three are first, and whoever’s left, must be Chatter. All four of these girls love playing together. They’ll be adopted out in pairs, but it would be absolutely awesome if someone wanted to keep the sisters together! 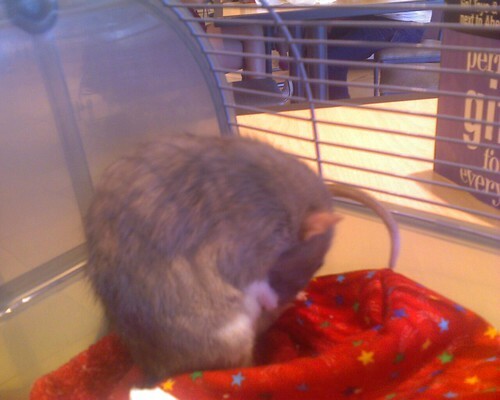 If you’re interested, just visit Mainely Rat Rescue and check out the instructions for adopting from us. Meet Bailey, originally uploaded by Folkcat. She was furiously washing herself while we had a late pizza lunch at the Fox Run Mall in Portsmouth. Bailey was surrendered to MRR the very day that our Lola passed. When I can get a good picture of her face, and tell you the rest of her story, you’ll see just how amazing that is. For now, we’re still on the road home. A New Shawl, originally uploaded by Folkcat. I’ve had two main knitting projects lately. One is the never-ending run of cotton blankets for the rats. The other is this entre-lac shawl. I’m knitting it from the point up so I can get it as big as I want w/o guessing. 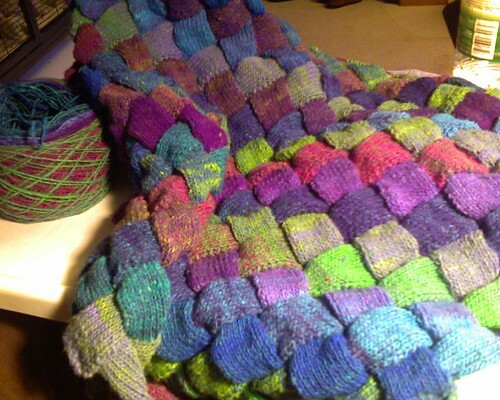 The yarn is Noro Kureyon Sock, color 229. The first group of foster girls that passed through our cages without being reported on here were the Mystery Girls. They were so named because two of them were reserved for adoption before arriving in our home, and their new owner named them for favorite mystery book characters of hers. These four girls were all sisters from the same litter. The entire family was turned in to a shelter in Maine when they were about 5 or 6 weeks old. These were the girls who were adopted first. I wasn’t familiar with either book series, but have learned that Sookie Stackhouse (the black Berkshire on the left) is the main character in the True Blood series, and Stephanie Plum is a bounty hunter in her own series. Inspired by adopter Betty’s names for these two girls, I plunged into my own favorite mystery series to name the other two. Yes, my favorite mystery books are the Sneaky Pie books by Rita Mae Brown, and the Cat Who books by Lillian Jackson Braun. That’s KoKo on the right up there, of course – a Himalayan rat seemed appropriate to name for a Siamese cat! Sneaky Pie and KoKo found an adoptive home of their own in short order, and now live with a young brother and sister pair of humans here in New Hampshire. Their new names are Phoebe (Sneaky Pie) and Piper (KoKo)*. They were really fun while they were here, though, and I miss them like I miss all my foster kids. Next Time on “Foster Updates”: The Soda Pop Girls! *Yes, the adoptive mother of their new family acknowledged that if they got more rats, they would likely be Prue and Paige!